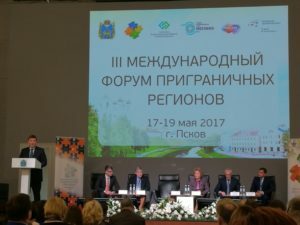 On 17- 19 May III Border Regions Forum was held in Pskov, Russia with the support of the Ministry of Economic Development of the Russian Federation. 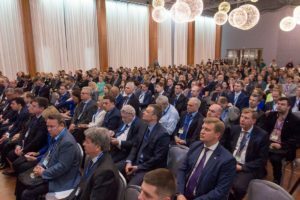 More than 400 participants including representatives from Ministries, regional authorities, municipalities, non-commercial organizations, financial institutions and businesses from Russia and neighboring countries took part in the event being more popular from year to year. Plenary session “Realizing the potential of border cooperation” started the second day of event. 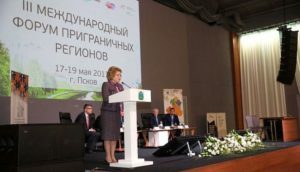 Forum was opened by the Chairman of the Council of Federation of the Federal Assembly of the Russian Federation, Ms Valentina Matvienko, who noted that it is already a tradition to organize Forum for the third time in Pskov and it also shows high demand for this event. 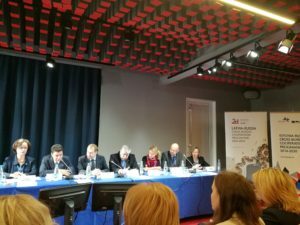 Ms Matvienko also mentioned that Forum has proved itself as an efficient platform for discussion of actual questions on mutual cooperation of border regions of Russia and its neighboring countries, development of integral projects in the sphere of business, creation of attractive business environment for investments. Governor of Pskov region, Mr Andrey Turchak has given welcome words and denoted that Pskov region is always open for a dialogue and ready to work as a reliable partner. During the International Forum Agreement between the Government of the Republic of Estonia and the Government of the Russian Federation on promotion of interregional and cross-border cooperation was signed by Minister of Public Administration of the Republic of Estonia, Mr Mihhail Korb and Deputy Minister of Economic Development of the Russian Federation, Mr Aleksandr Tsybulsky. 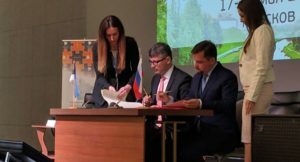 This agreement has been developed for more than 10 years and now after signing will allow to solve issues regarding cross-border cooperation between the two countries, including organizing travel and trading and responding to emergencies. Forum agenda included several round tables oriented on cross-border cooperation, discussion of export, logistics and tourism development. The highest interest was demonstrated at the round table devoted to the cross-border cooperation. 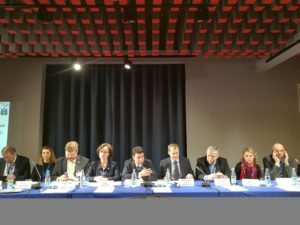 Presentations on experiences, achievements and challenges in cross-border cooperation were provided also by the representatives of the Estonia-Russia, Latvia-Russia, Karelia, South-East Finland- Russia CBC Programmes. 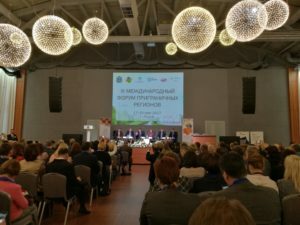 Results of previous and perspectives of current Programmes were highlighted by vice governor of Pskov region, representatives of Mineconomy and MFA of the Russian Federation. On 19 May the guests of the Forum visited projects implemented in Pskov in the framework of the Estonia-Latvia-Russia CBC Programme within ENPI 2007-2013. Bright examples of successful cross-border cooperation were presented to the participants in the waste water treatment plant and Dendropark. The main purpose of the Forum is contribution to socio-economic development of border regions by means of integral projects in the sphere of business, development of civil society and interaction of different levels’ authorities.